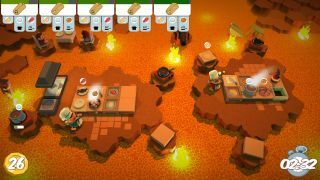 Perhaps the biggest challenge of Ghost Town Games and Team 17’s Overcooked is reaching the end of any given level without having set the kitchen on fire. I speak from experience, having watched pretty much every in-game kitchenscape I’ve graced go up in flames—a problem which others appear to have struggled with too. The best thing about it is this is part of the fun. If you think you might fare better, you can now test your own culinary clout as Overcooked has launched on Steam, and celebrates with the following release trailer. Across 28 standard campaign levels, as well as an end boss, players can whip up a storm either on their lonesome or via local co-op—the latter of which Tom suggests best portrays what the chaotic kitchen ‘em up has to offer. Best served with friends are Overcooked’s nine local versus levels. Depending on how much you value your friendship, you can even split gamepad controls and share the same controller with a pal. There’s no online co-op for now, which is a shame, however there is the choice of 14 different chefs to play as, as well as a range of kitchen settings—such as aboard spaceships and moving vehicles—to flounder within. And inevitably set on fire. Overcooked is out now via Steam for £12.99/$16.99/€15.99.